French President Emmanuel Macron fields questions from students at a town hall hosted in the Smith Center Wednesday. The president of France fielded questions from students at a town hall in the Smith Center Wednesday during his inaugural visit to the United States. Before heading to GW, Emmanuel Macron – who was elected as the youngest president of France last year – visited President Donald Trump for a state dinner and spoke before a joint session of Congress about international issues, like the Paris Climate Accord. Macron responded to a range of questions at the town hall, like what it was like to meet the Dalai Lama, how to expand the French language around the world and his response to railway worker strikes in France. Shortly after his talk, Macron held a press conference in the Marvin Center, where he discussed international politics and the importance of preserving the Iran nuclear deal. Before arriving at the Smith Center, Macron ate at Tonic Restaurant, where students lined the streets to protest recent airstrikes against the Assad regime in Syria. Macron said he sympathized with the protestors but that the strikes were in response to terrorist attacks in the western world. Macron said his position is similar to the one President Donald Trump has taken on the conflict – that attacks on Syria can end once terrorists are finally defeated. He said Trump’s willingness to pursue a peaceful solution to the conflict is encouraging. Macron spoke about rising instances of attacks on Jewish people in France, calling the trend a resurgence of anti-Semitism exacerbated by the divisive Israel-Palestine conflict. The solution to the problem, Macron said, is to fortify Jewish communities, educate students in school about religious tolerance and reaffirm a vision of French society that includes Jewish people as vital members of society. Macron then turned to immigration policy and crime rates in France. He said one way to reduce the level of crime in the country is to provide a quality education to the children of migrants, so that they can find job opportunities in French society. In the aftermath of Britain’s vote to leave the European Union in 2016, Macron talked about the benefits of the intergovernmental organization. He said complex problems facing Europe — including privacy rights, attracting innovation and climate change — could be handled through the EU. “I do believe that given the current challenges we have, the European Union is the best way to organize ourselves and deal with these challenges,” he said. The French president said a single nation attempting to solve these multinational problems would run into roadblocks. The stability the EU provides Europe, Macron said, was also an indispensable resource for the continent. Throughout the night, Macron tied various issues, like migration and national security, back to climate change. Regardless of U.S. action or inaction, Macron emphasized that mankind will live with the consequences of a changing environment. 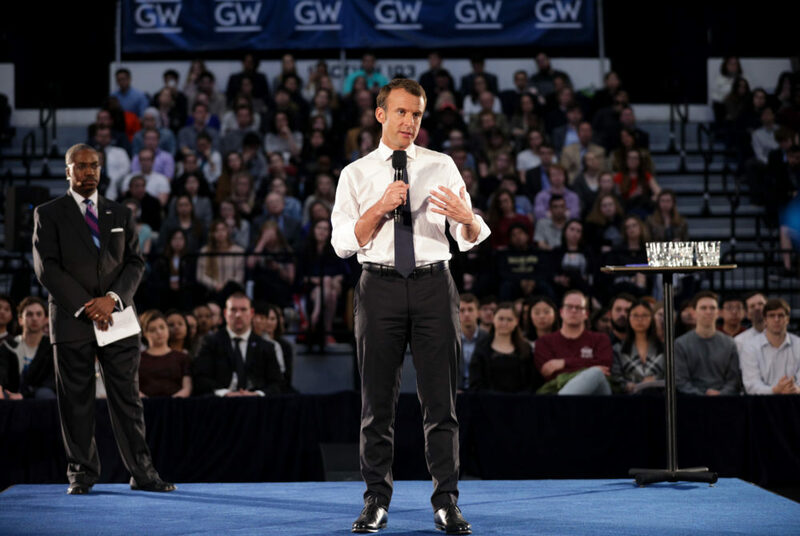 Macron said it would be the job of GW students — part of the next generation — to fix climate issues, like air pollution and the loss of biodiversity.